Xiaomi is expected to launch the Mi 7 flagship smartphone as the successor to last year’s Mi 6. However, the company has already confirmed to launch the Mi 8 as the successor to last year’s Mi 6. The Xiaomi Mi 8 will be officially unveiled on May 31st in Shenzhen, China along with all-new MIUI 10. Today, the company also mentioned unveiling the all-new MIUI 10 on the same stage. Earlier this year, the company released the MIUI 9.5 which brought the Android 8.0 Oreo for Xiaomi devices. With the MIUI 10, the company might bring in new features and gestures apart from the latest Android. Talking about the Xiaomi Mi 8, it might be the first smartphone from Xiaomi to feature notch display. The leaks also suggest the company to introduce Face ID-like technology with its new flagship smartphone. Till now, the company launched the MIX-series smartphones with the three-sided bezel-less display. The Mi 8 might also be the first Xiaomi smartphone to feature an under-display fingerprint sensor. While there is no official confirmation, the Xiaomi Mi 8 is mentioned to come with 6.01-inch full-screen display and 10nm Qualcomm Snapdragon 845 Mobile Platform. There will be dual cameras on the rear equipped with AI and offers 2X optical zoom. It is expected to be priced at 2799 Yuan for the base variant with 6GB RAM. The official launch date is just a week away, and we expect to see more leaks in these few days. Lately, we are seeing several leaks about the upcoming Xiaomi Mi 8 flagship smartphone. It will be officially unveiled along with the MIUI 10 in the next few days. Even the device recently got FCC certified with the model number M1803E1A. 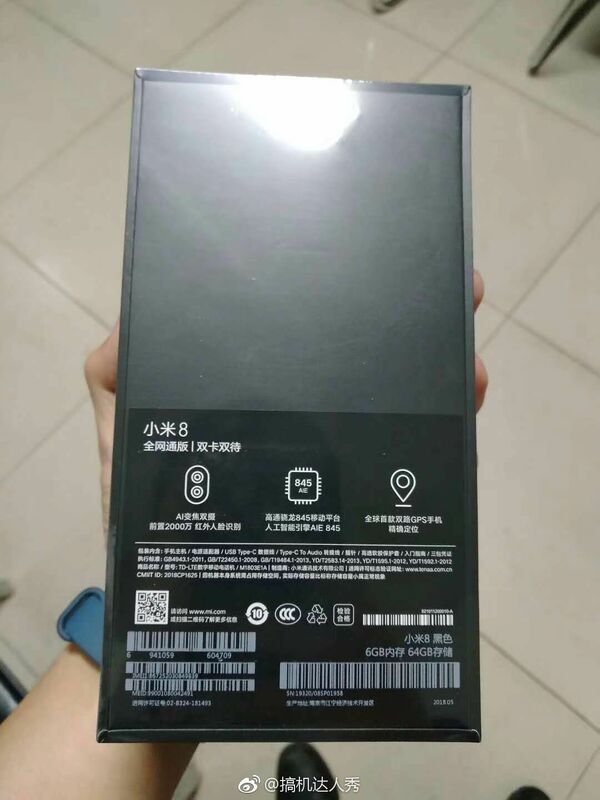 Now, the images of the Xiaomi Mi 8 retail box are leaked online. The leaked device seems to be the base variant with 6GB of RAM and 64GB of internal storage. Talking about the features, the Mi 8 will come powered by the 10nm Qualcomm Snapdragon 845 AIE processor which comes with AI-based enhancements. On the front, we will be looking at a whopping 20MP selfie camera. While it is rumored to come with an in-display fingerprint sensor, the retail box at least confirms the presence of Apple Face ID-like technology. On the box, it is mentioned to come with an infrared-based face recognition technology. It will be coming with dual cameras on the rear with AI Zoom feature. We can expect even more leaks about the upcoming Xiaomi Mi 8 in the coming days. Stay tuned on PhoneRadar for more details!